Yesterday, my son and I had the pleasure of being invited to a special reception held in honor of fathers hosted by Oral-B and the March of Dimes, with Eli Manning being the guest of honor. We were very excited to attend! In recognition of father’s everywhere, Oral-B and March of Dimes has launched the #PowerofDad campaign. I absolutely love the idea of this campaign. It’s so nice to see the hard work and devotion of fathers appreciated and put on display. At this event, we got to listen to Eli speak about the importance of fathers and how he feels it is his most important role. I was so impressed with him and what he had to say. By his side was his adorable little girl, Ava. Throughout the gallery, we were able to see family pictures of Eli and his dad, Archie, as well as special moments with his own little girls. We also got to see special moments caught on film of an assortment of other dads. As we know, it’s those special little moments that put smiles on our faces and bring the best memories. 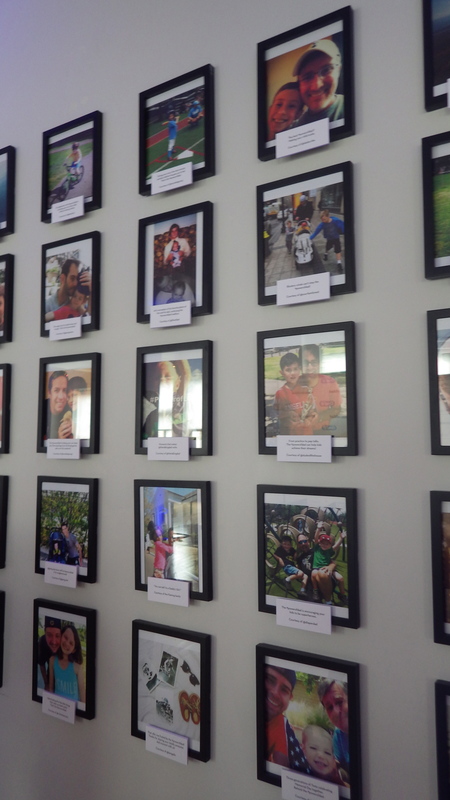 We really enjoyed seeing so many happy memories and families through photographs. 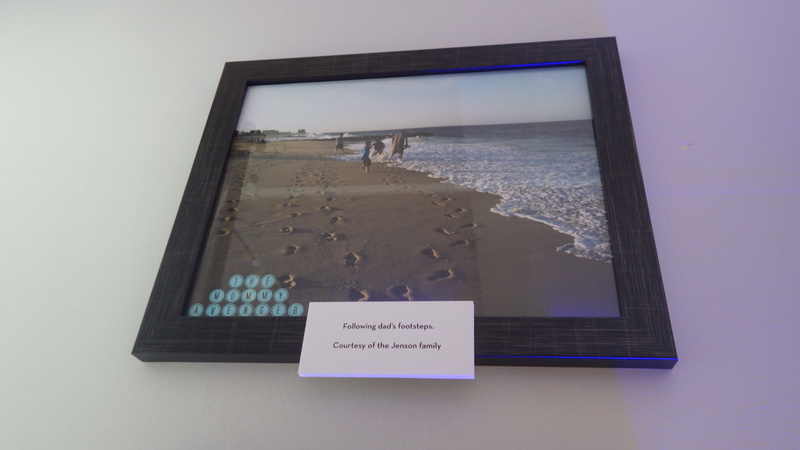 I was honored to have my own photograph of my husband and boys walking in the sand on display. When seeing Eli Manning’s personal photographs, I loved seeing him with his little girls as a new dad. I also really loved a photo of Eli as a little boy playing football with his own father. These were really sweet photographs. Getting to hear his thoughts on fatherhood were really wonderful and I appreciated the insight into his personal life. My son and I later had the opportunity to sit down and ask Eli some questions, which was an amazing experience for my son, especially. My son is a huge Eli Manning fan, so the fact that he was able to ask him anything he wanted was really special. We wanted to know a few things about the part of Eli that is a father. For example, what does he think is an important aspect of being a dad? He answered that having a sense of humor is the way to go. He likes to go home to his little girls and turn on some music and dance with them, spending quality time together laughing as they dance. What kind of music do they dance to? Whatever’s on the radio, but songs from Frozen are definitely a favorite! Is there anything Eli’s father used to say to him that he now says to his own children? Most definitely! He was always taught to show respect and say “No, ma’am,” and “Yes, sir” when speaking to adults and to always look people in the eye. You can bet that Eli’s girls are being brought up the same way. We wanted to know how Eli mentally prepares for a game. He responded that he spends hours each week mentally going through each possible scenario and practicing how he will react. He also spends many hours watching film to study plays. Playing out all the scenarios in his head beforehand is key. What advice does Eli have for a young boy that wants to make it big in football? He recommended taking the time to enjoy the game. He would play and practice as often as he could. He played baseball, basketball and football and enjoyed them all before deciding to focus on football. Once he did, he would get his friends together to practice with him whenever he could. He suggested getting your friends together and to spend lots of time playing, lots of summer practices, and conditioning with friends. He also encourages kids to listen to their coaches and work hard. Finally, my son asked him what it was like to play Peyton in a game. Eli’s response? It was a very special memory looking up and seeing his big brother on the field with him as the played the National Anthem. He shared that they support each other 100% and that it was fun, yet challenging, to play each other in a game. We so enjoyed our time spent with Eli, getting to know him and his family stories. You can see and hear that Eli has a lot of love and admiration for his family and it is so refreshing to hear. Eli is a great role model for kids (and adults) and it was a great opportunity to meet him and talk to him. Want to know more about the #PowerofDad campaign? Visit www.powerofdad.com. While you are there print out a $7 off coupon for the latest Oral-B products (which are beyond fantastic!) and enjoy photos of special family moments. Always special to see first hand father moments with their children! Looks like you had a great experience! what an awesome event to attend! celebrating dads is a great thing to support and go to. Wow! What fun! I like all the photos! Great way to celebrate dads! Eli is handsome, funny and smart! This is a great event to attend to. and i Loved the video. This looks like such a great event. I am sure you all had a great time. Great event.. The candid pictures of Eli and his daughter are great!! I would have liked to sit down and talk to him also.. big Giant Fan! Sounds like a great event. Eli sounds like he is a really nice, family man. What an awesome experience!!! He seems like a great guy! Eli Manning had a happy childhood with his Dad and I’m sure that helped a lot when he assumed the role of being a father too. Fathers are amazing, yours just happens to be extra special. He seems like a great Dad and advance Happy Father’s Day to all Dad . Aww those photos are so sweet and such sweet sentiment. Great event! Its nice to see a different side of Eli Manning not as an athlete but more as a son and as father. Interesting how much thought goes into the possible game scenarios beforehand. So cool that your son got to ask questions! YOur photograph was amazing! I remember comenting on thsoe footsteps in the sand. SUch a powerful image. Great to know you enjoyed the event. This was such a great cause and your son must have thought he was on the moon. Thanks for sharing. What an incredible opportunity for you and your son. That picture of your family on the beach is truly special. By the way, I love Eli Manning. What a wonderful interview and the campaign is amazing! It’s so good to see campaigns that value fathers and the role they play in their children’s lives. The world needs dads! This looks like a great experience. I love the pictures, so beautiful! What a great experience. He seems like a great dad.